Beach Slang is a really odd band. While I do like them, sometimes I feel like they're begging me to roll my eyes and make fun of them. Beach Slang has a lot going against them. There's the awful over sentimentality of their lyrics, which really border on too cheesy for about eighty percent of the album. Then there's the truly ridiculous production on the vocals, which sound like a mix of trying-too-hard Blake Schwarzenbach and a Decepticon with strep throat. It's actually remarkable that the songs themselves are good enough to overcome these things. 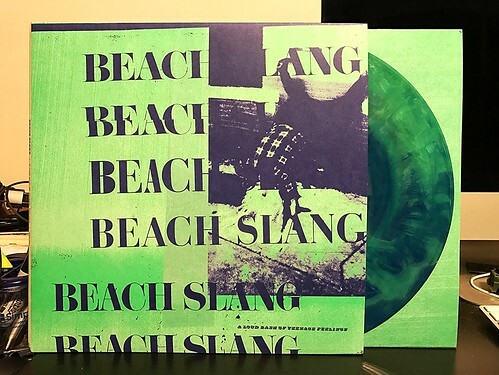 That ability to make these songs listenable, more than anything, is at the heart of Beach Slang. Even if the heart is on your sleeve, in your throat, broken or any other clichéd song device (and every one of them is fair game for Beach Slang's middle school diary of lyrics), what this band has been able to capture is a big, important sounding bash of rock and roll songs. The tempos vary from straight ahead rockers like ""Future Mix Tape For The Art Kids" to slightly faster ragers like "Atom Bomb" to slowed down, triumphant beauties like "Hot Tramps." These guys have the chops to make the music itself seem rich, full and important. That they are using it to delivery the message they are is somewhat suspect, but I'll take a good song when it is presented to me. At then end of the day, A Loud Bash Of Teenage Feelings is a good record. The more I listen to it, the more I become numb to the lyrics and just enjoy the songs for what they are. I imagine if you are fourteen years old and feel a bit out of place, this type of music is probably somewhat cathartic and helpful. But when you're closer to forty, you can just appreciate the fact that there's a few guys out there putting out music that's pretty good. Sometimes, that's enough.